We manufacture qualitative products, which are of low cost and helpful to store waste materials. These Water Resistant Garbage Bags are leak proof, resistant to water and any kind of weather. Our gusseted garbage bags are widely used for collection, storage, disposal and handling of different waste stream such as clinical, recycling, domestic, hospital, kitchen waste etc. These are made of qualitative raw materials and so are durable and reliable. 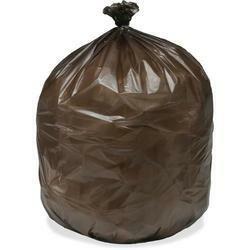 Looking for Degradable Garbage Bags ?